Jewish tradition names Ezra as author of Chronicles, or sepher dibre hayyamim, “book of events of the days,” which originally appeared as one book until Greek translators divided it into two. Some scholars believe Chronicles, Ezra and Nehemiah were all originally one work. Ezra likely wrote Chronicles in the mid - to late 5th century B.C. The books outline the genealogy of God’s people from Adam down to the Persian Empire, emphasizing David and his descendants in Judah and the building of the temple. They occasionally include short biographical sketches of kings or historical events, usually with more detail than in 1 and 2 Kings, and exclude almost completely the kings of Israel. In this history of Judah, spiritual lessons supersede political, military and personal details in importance. A theme of Chronicles is the re-establishment of Israel as a nation in the land that God promised them. Though written at a different time and from a different perspective, Chronicles covers the same time period as Samuel and Kings. In contrast to their political history, Chronicles presents a religious history. 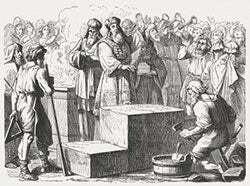 After the Babylonian captivity, as Judah settled back into life in their homeland and re-established the temple ceremonies, the devout among them likely expected that the temple ceremonies would never again be interrupted. The time was ripe for a book that emphasized the correlation between obeying God’s commands and prosperity, and rejecting God and destruction. 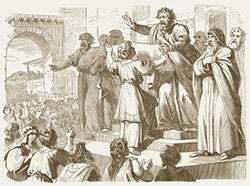 The author presents each king in light of his obedience or disobedience to God and presents the corresponding consequences of the kings’ behavior, presumably in an effort to prevent the Jews from falling into sin again. Today, though reading all of the “begats” in Chronicles may bore us at times, the lists of names remind us that God knows each individual personally. Chronicles assures us that God will fulfill His promises to us as well.